"If you see a tree as blue, then make it blue." 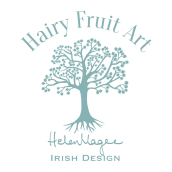 This print is an archival art print from an original illustration by Helen Magee. Printed on beautiful quality watercolour paper with pigment inks which will not fade over time. Unframed prints are mounted in an archival single white mount complete with backing board and protective sleeve. Framed prints are supplied ready to hang in bespoke contemporary off white wooden frames that suit all colour schemes. Our prints are made to order so please allow 7-10 working days for processing your order. Archival art print from an original watercolour illustration by Helen Magee. Printed on beautiful quality archival paper which has a slight texture using pigment inks which will not fade over time. The mounted prints are mounted in archival mounts. Framed Prints are framed in white bespoke wooden frames with archival mount board. Archival art print from an original gouache illustration by Helen Magee. This gouache illustration incorporates a beautiful collection of blue and white crockery. This print is an archival art print from an original illustration by Helen Magee. Mr and Mrs (Duck) is the perfect gift for the happy couple.